Owing to a large number of animals, and specifically stray and surrendered dogs that were taken in over the last few months, we have been battling a serious Canine Distemper outbreak at our Waltloo branch. Distemper is a serious airborne virus that spreads rapidly among dogs. The disease also has an incubation period and symptoms often take time to manifest. Dogs may initially appear healthy, only to become sick later. Vaccination is the only way to prevent this disease however the Society takes in all animals with no guarantee that these animals were vaccinated prior to surrender. As a result of the outbreak safety measures had to be put in place. One of these included the suspension of our Adoption service in order to quarantine the premises and prevent the decease to spread. The situation was closely monitored by our kennel and veterinary personnel; healthy animals were vaccinated before they were moved to our Adoption kennels. Here they underwent further monitoring for an extended period to ensure they remain decease-free and we are thrilled to announce that the suspension of our Adoption services has now been lifted. We urge the public to contact their nearest SPCA Tshwane branch and give one of these adoption dogs a chance at a forever home. As a general precaution, we also urge the public to ensure their pets’ vaccinations remain up to date. Bolt was viciously attacked by other dogs just after Christmas 2018. When he was admitted to Waltloo clinic, he was unable to stand, collapsed and in shock. His owner was distraught. Both his front legs as well as his head and neck were severely macerated, and his wounds were deep and septic. He was vomiting blood. He did not show any response to the first three days of intensive treatment in the hospital. – he just remained collapsed and inappetant. We thought that Bolt was not going to make it but he pulled through! After many bandage changes and intensive medical treatment, Bolt is finally his old self again. He is eating well and wagging his tail. We are so very happy to see his wonderful personality shine through. What a fighter! 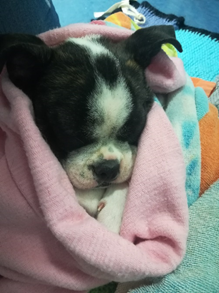 This sweet little Boston Terrier cross was surrendered to the SPCA in late 2018. Unfortunately, he suffered from the disease called Parvovirus also known as “Katgriep”. The disease carries a very poor prognosis, and many unvaccinated puppies die from it. Our Veterinary staff comes across several cases on a regular basis, particularly during summer months. Because of his adorable nature we just had to try to pull him through. He was isolated from all the other dogs, and we started the supportive treatment straight away. Through the hard work, and lots of TLC of everyone involved, and not to mention his fighter spirit, he made it. He has since been adopted by a loving family, and the adorable guy was lucky enough to get his “furrytail” happy ending. Owing to the large number of animals, and specifically stray and surrendered dogs, we have taken in over the last few weeks we have been battling a potential full-on Canine Distemper outbreak at our Waltloo branch. Distemper is a serious airborne virus that spreads rapidly, and there is no cure. Symptoms often takes time to manifest and dogs may initially appear healthy, only to become sick later. The health and well-being of all animals in our care must take priority at all times, and we are doing everything we can to contain the threat of a full-on outbreak in our dog kennels. Our Veterinarians and kennel personnel have been working together to ensure that strict hygiene and isolation protocols are continuously followed to prevent further spread of this virus – however, the situation has become more serious in recent days. As such, the Management Committee in consultation with our Veterinarians and kennel personnel, have taken a decision quarantine the branch’s kennels for at least four weeks to stop a full-on outbreak. Through a rigorous cycle of continuous monitoring, testing and vaccination coupled with deep cleaning kennel blocks and common areas as well as isolation procedures, we are optimistic that a full-on outbreak can be stopped. Sadly, given the seriousness of the virus, the potential for suffering and the high infection possibility, the humane euthanasia of certain dogs cannot be ruled out. Quarantine procedures mean that our normal services will be limited, and in some instances suspended. During the quarantine period, no dog adoptions will be processed as we cannot, in good conscience, adopt out potentially sick dogs. This will result in suffering and heartbreak, and the potential spread of the virus outside of the branch. Access to the branch’s facilities will be restricted and boarding services will be suspended. Our animal hospital’s public services will be limited to give the Veterinarians extra capacity to direct their time and effort to the animals in our care. Notwithstanding the quarantine, we will ensure that there will be someone available at all times to accept stray and unwanted animals (under strict isolation protocol) at the branch and our Inspectorate will operate as normal. Cat and other animal adoptions will be managed by appointment. Our Centurion branch is not affected in the same way at the moment, but we continue to monitor the situation there and will implement similar measures if necessary. The quarantine at the Waltloo branch is effective immediately. We urge all dog owners to vaccinate their dogs against Distemper. The first signs of Distemper include sneezing, coughing and thick mucus coming from the eyes and nose. Fever, lethargy, sudden vomiting, diarrhea and loss of appetite are also common symptoms of the virus. Please be assured of our best efforts at all times ensuring the health and well-being of all the animals in our care. When animals are exposed to high temperatures, they are vulnerable to dehydrating or suffering from severe stress. In order to prevent this pet owners should start preparing to protect their pets from the heat in advance. Ample water that is both clean and cool should be easily accessible for animals. If there are a large amount of animals, there should be a large amount of water sources that is spread out so as to prevent overcrowding at one source. The water containers should be fixed in such a manner that it will not get tipped over by animals. Water should be fixated to pipes that can either automatically refill as water levels decrease or owners should check every so often that the water containers are always full. 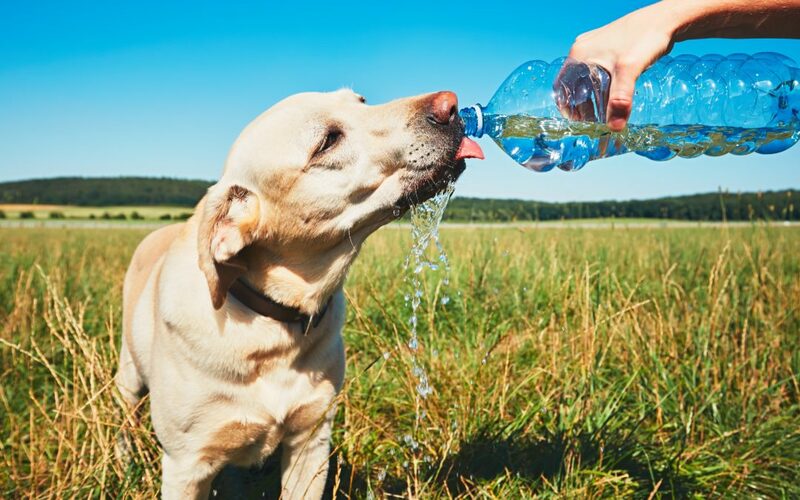 Owners should familiarize their pets with the different water sources days in advance from the heatwave. This is to ensure that the animals do not have to search for their water in the heat. Water sources should also be placed nearby shady areas so that the animal doesn’t have to travel far in the heat in order to get water. Pet owners should ensure that there is plenty of suitable shelter for all their pets. If there is a large number of animals, the owner might have to consider separating the animals into groups and providing individual shelter for each group to prevent overcrowding which will increase the risk of the animals becoming stressed. Suitable shelter is shelter that simultaneously shelters the animal from the harsh sun as well as allows cool wind to pass through. Shelter that is made out of materials such as aluminium or galvanised steel for the roof because they reflect the radiative rays of the sun, shelter made from cloth/timber/corrugated iron. The inside of your home is also suitable due to there being shade, ensure windows are left open to allow the cool wind to pass through. Large trees that can provide great amounts of shade. We advise that owners do not only rely on the shelter of trees. Kennels must be moved under the shade. We do not recommend that owners travel with their pets during the heat wave unless it is a matter of urgency. In the event of an animal needing to be transported during the heat wave we advise that the animal be transported in the early hours of the morning or in the later hours of the day toward the evening when temperatures are at their lowest. Owners should stop ever so often when traveling long distances and should provide the animals with cool water. Under no circumstance should an animal be left alone in the vehicle in the sun, even if the windows are open. Pets should not be forced to exercise/work in the heat. If you would like to exercise with your pet it should be during the early hours of the morning or the evening when temperatures are low. Animals that have no access to water, shelter and food. IMMEDIATELY remove the animal from direct heat/sunlight. Pick the animal up and place it somewhere shady and where there is cool wind blowing. Offer the animal small amounts of cool, clean water. Wet the animal’s feet and legs. Spray the animal with cool water. Smaller pets can even be placed inside buckets of water for a short period under the supervision of the owner. If the animal is not cooling down, it should be taken to the vet immediately. The Society for the Prevention of Cruelty to Animals, Tshwane (Tshwane SPCA) inspectors are bracing themselves for an increase in animal casualties as the festive season approaches. In a bid to curb the annual numbers of casualties, the Tshwane SPCA is warning the public that animals may be injured and killed, unless precautions are taken against the indiscriminate use of fireworks. 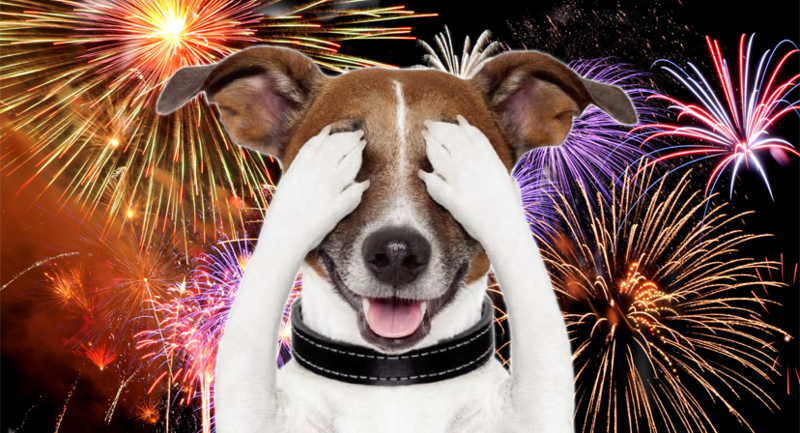 The Tshwane SPCA appeals to everyone to be alert to the very real effects of fireworks on animals. 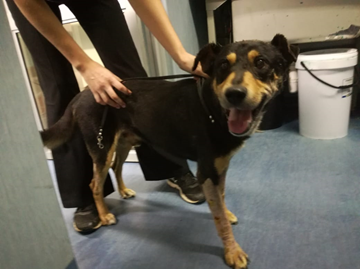 Despite annual warnings to pet owners about the dangers of fireworks we continue to receive calls about animals suffering horrifically from the effects of fireworks. Most of these injuries could be avoided if organised events and fireworks activities are planned more carefully and kept away from residential areas and farm animals. Animals subjected to noise and the flashing of lights of fireworks is harmed in several ways, including psychologically through extreme fear, which may persist even after the event. This can lead to a lifelong anxiety problem. Animals are injured when they try to run away (breaking through windows, fences, razor wire etc.) Pets are run over by vehicles while running panic stricken in the streets. Wild animals and birds are often forgotten in our primary concern for our pets. Many of these animals hunt at night and can become disorientated by the noise and flashes. The Tshwane SPCA believes no responsible person should set off fireworks knowing the terror that will be experienced by animals in the vicinity. Pets have hearing ability far in excess of that of humans. The “bang” you hear when a firework is set off is experienced seven times louder by your pet. Remember a dog can hear a grasshopper eat, so imagine the fear an animal feels when a firecracker explodes. ANY VIOLATION OF THE ACT SHOULD BE REPORTED TO THE LOCAL SAPS, METRO POLICE AND ALSO TO THE SPCA. Never set off fireworks near any animal. If possible, stay at home with your pets and encourage calm behaviour. If you can’t be home with them, keep them inside and preferably in a room such as the kitchen where the windows are higher (and more difficult to jump through). Attempt to reduce any noise by closing curtains and playing calming music at a reasonable volume, to reduce the noise and effect of fireworks. Place familiar and comforting items around them such as baskets, blankets, toys etc. Provide them with something to do such as giving your dog a bone to chew or lots of catnip or a catnip toy for felines. Ensure your pets have a hearty and nutritious meal around nightfall. This may make them drowsy and more likely to sleep. Take rabbits and other outdoor pets into a garage or outbuilding. Ask a veterinarian to prescribe a sedative. Never, ever give medication for humans to animals. This includes paracetamol & “Rescue Remedy”. Effects on humans and animals are not the same. The consequences could be tragic indeed. The effects and consequences may not be immediate, but long-term health damage could be caused to your pet. Leave your pets to take refuge in a corner if they wish. Rather leave your pet to hide, as they feel more comfortable in that position. Make sure pets are properly identified with a collar and name tag as well as a microchip. Should all your precautions fail and your pet does escape, you have a better chance of having your pet reunited with you. All cats’ collars should have an elastic insert. Dogs that panic can choke on a collar or leash so never use a choker chain or slip collar to restrain your dog. Pet collars, microchips and sedatives can be obtained from your local SPCA branch or your local veterinary clinic. Should you go on vacation, please remember that the SPCA provides boarding facilities for your pets. Should private persons look after your pets, please ensure that you provide them with your veterinarian’s name, address and telephone number. They should also be in possession of your pet’s life-history cards. Should your pet become lost, please remember that your pet might have been picked up by a member of the public, who could have taken your pet to your local SPCA. All information about cruelty and injuries to animals should be reported to the local SPCA branch, at the following telephone numbers. Information will be handled in strict confidence. Emergency staff will be on duty during the festive period.